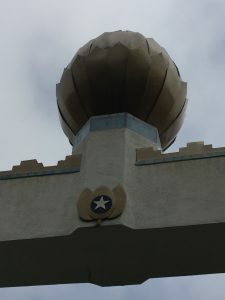 Yogananda when looked up from the peace monument where some of Gandhi’s ashes are consecrated to see a pentagram displayed in a lofty position over the peace arch. 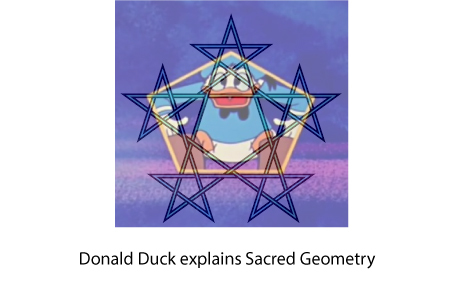 It made me wonder, how many people know about sacred geometry? The Greeks were searchers of eternal truth through logic and they formalized and made profane much of the learning of mathematics and geometry. To many people, the pentagram symbolizes devil worship. In actuality, the pentragram is a symbol of divine mathematics and was studied by the Greeks who learned it from the Egyptians. In late antiquity, students were required to study the trivium, then the quadrivium. It was the beginning of democratization of knowledge. The trivium were the grade school disciplines of grammar, logic, and rhetoric. When the mind was developed enough to master those, the next four were: arithmetic, geometry, music, and astronomy. All seven of those disciplines were required to master the big one: philosophy. I went to a friend’s jazz concert two weeks ago and he surprised that I knew about the Pythagorean ratios and the method of teaching music because many advanced music students hadn’t even heard of them. Learning the monochord was properly the beginning of knowledge for any young mind in Late Antiquity. With a monochord, the ratio of a string halved is an octave. When the string is divided in thirds, you get a perfect fifth. When it is divided in fourths, you get a perfect fourth. These truths don’t depend on your identity politics, the official government position, or your force of will. Because the truth is a matter of perspective, even and perhaps most especially scientific dogma, we need to understand that what we see in aesthetics, whether man-made or natural, are not just true, but they are factual. And facts are a universal constant, unlike truth which is wielded like a billy club by whomever is in power. 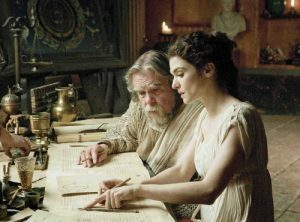 Because the philosopher Hypatia was a Neoplatonist, she would have held the pentagram as the mot sacred symbol. History tells us she would ride her chariot through Alexandria with her symbol on the front and in my mind, it could only have been the pentagram. To read about the Neoplatonic philosopher, download my Houston Film Festival Award winning screenplay, Nike’s Last Stand, about the last days of Late Antiquity and the tipping point into the Dark Ages. There is also a movie about her called Agora (2009).